It had been a while since I treated myself to a little splurge at the Book Depository and I found some really great deals that I couldn’t pass up. It’s always so fun to get books in the mail isn’t it? 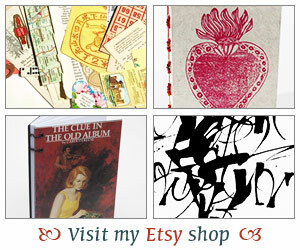 Here are the books I bought. 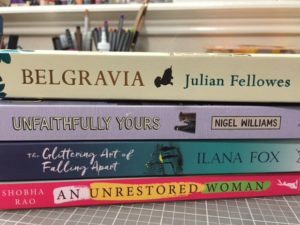 Belgravia by Julian Fellows, Unfaithfully Yours by Nigel Williams, The Glittering Art of Falling Apart by Ilana Fox and An Unrestored Woman by Shobha Rao. The only book I’ve really heard much about is Belgravia but I liked the descriptions of the other books. I especially liked that these aren’t books that I would normally find at my local B&N shop. I also have a little book bundle I picked up from my mystery book group. When I met up with them a couple of weeks ago it was also our book exchange night. We do those twice a year. Pretty much you bring books you want to pass along. It doesn’t have to be just mysteries and it’s fun to see what other books members are reading aside from mysteries. This is the little stack I picked up. Granted my stack looks huge thanks to the Joyce Carol Oates book on the bottom. I can’t even remember what the premise of the book is but I just know I’ve enjoyed some of her other books before. Two books here are by the same author, Janwillem van de Wetering. I feel like I’ve seen him mentioned before on mystery lists of writers not to miss, etc. I’ve not read any of his books so it was great to pick up two from his Amsterdam police series. I have Death of a Hawker and The Maine Massacre. 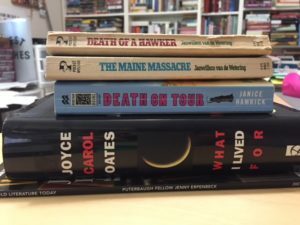 The other book I picked up was Death on Tour by Janice Hamrick. A cozy whodunit set in Egypt. Oh and I actually haven’t told you about another neat place I found for book deals. I’ll save that one for my next post because of course I bought some books there that I need to share! Let me know if you’ve read any of these books. Belgravia sounds like a winner. It also reminds me that I need to spend some time watching the rest of Downton Abbey, which I never finished! I’m watching Season Three of The Bridge and after the first episode, I’m not liking it nearly as much as the previous seasons. 🙁 Hope you’re surviving the heat! Haven’t read a single one of these. Have fun reading and letting us know what you think! Belgravia was such fun! It was a read/listen combo for me and I hated to se it end. Can’t wait to hear about the rest of your new books.